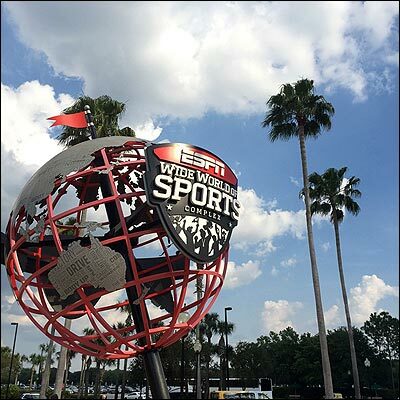 ESPN Wide World of Sports complex is a multi-million dollar international sports complex that hosts amateur and professional events and festival and tournament events. This 255 acre facility is home of the Pop Warner Super Bowl and National Cheer & Dance championships. It is also the spring training site for the Atlanta Braves. The Complex also serves as headquarters for a variety of sporting events taking place throughout Walt Disney World, including Run Disney events. Home of the Multi Sport Experience, an interactive sports playground, the sports complex offers over 70 types of sporting experiences. The complex includes a baseball stadium; Field House that showcases basketball, wrestling, and volleyball; a track-and-field complex; tennis courts; and fields for soccer, football, and more. General admission tickets cost $17 for adults, $12 for children 3-9. Tickets are available for purchase at the front gate and allow guests to watch all "nonpremium" events. Tickets to premium events, including Atlanta Braves spring training games, may be purchaesd through Ticketmaster, and include general admission to the complex. Premium event tickets can also be purchased same day at the complex box office, subject to availability. The ESPN Wide World of Sports Grill is a sports-themed restaurant at the complex filled with baseball mitt-shaped booths and large-screen televisions. This restaurant is only open on event days. In addition to this location, there are over 30 concession stands on the complex, offering up hot dogs, popcorn, snacks, soft drinks, and beer. Bus transportation to the ESPN Wide World of Sports Complex is available from Pop Century Resort, All Star Resorts, and the Caribbean Beach Resort. Guests at other Disney resorts must first take a bus to one of those three resorts and then transfer. Buses run Thursday-Monday, 5pm-11pm. Buses are available from ALL resorts during Run Disney events, beginning one hour prior to complex opening time.